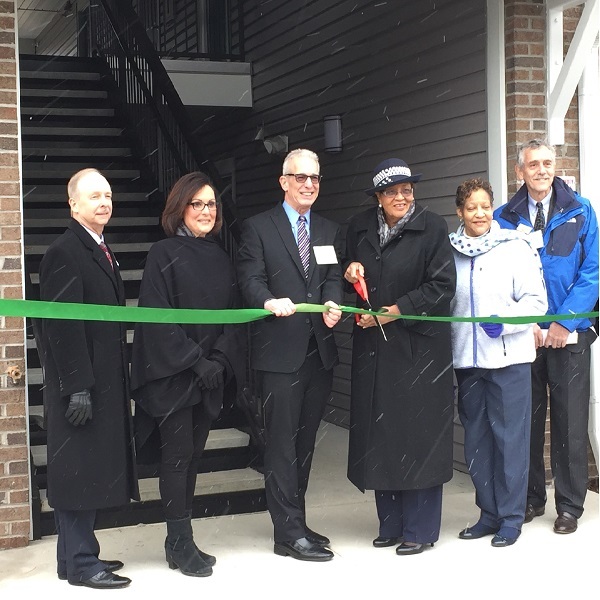 GREENSBORO, NC – Affordable Housing Management, Inc. (“AHM”) which is celebrating its 45th year anniversary, announced it recently completed construction on the Hope Court development, a 16-unit supportive apartment community located near the intersection of Gate City Blvd. (High Point Rd) and Holden Road. The property offers one, two, and three bedroom non-smoking apartments affordable to individuals and families earning below fifty percent (50%) of Area Median Income. Six units are reserved for households with a disabled or formerly homeless member. Hope Court is certified Energy Star Version 3.0 and National Association of Home Builders Green Building Standard Gold level. Hope Court features spacious one-, two-, and three bedroom units with two full baths in the two- and three-bedroom units. All appliances, including washer and dryers, are included in each unit. There is tot lot playground and picnic area. The community is non-smoking with an exterior smoking area provided. Hope Court is funded by the City of Greensboro (Federal HOME funds), the North Carolina Housing Finance Agency (NCHFA) – Supportive Housing Development Program (NC Trust Funds), and AHM. Additionally, grants were provided by Federal Home Loan Bank of Pittsburgh, Wells Fargo Foundation, Community Foundation of Greater Greensboro and the Lookout Foundation. In addition to Hope Court, AHM is nearly finished with a major rehab at one of its existing apartment communities, Berryman Square, in northeast Greensboro. In the spring of 2016, AHM will begin construction of Sumner Ridge, a 72-unit affordable multi-family community on Old Randleman Road. AHM has developed 1,661 affordable apartment units in its forty-five years of operations. AHM, formerly known as Greater Greensboro Housing Foundation, is a private nonprofit organization whose mission is to provide quality affordable rental housing for low to moderate income households, including the elderly and disabled. AHM’s mission is accomplished through the development and management of affordable apartments for those households. AHM is located at 330 South Greene Street, Suite B-11. For more information on AHM, call 336.273.0568 Ext. 126, email info@ahmi.org or visit www.ahmi.org.